W. W. Norton & Company, New York, 2014. 287 pages. I normally knit while I read nonfiction (with the help of a Book Chair), and naturally this book was a perfect choice. Twenty-six different authors here present musings about their relationships with knitting. Some are non-knitters, but they, too, have interesting stories to tell. I love the wide range of experiences in this book. These are excellent authors who know how to make their musings interesting and entertaining. Of course, if you love knitting, that’s not a stretch. In the Introduction, Ann Hood explains how knitting saved her after her little daughter died, and how this book came about. This idea for an anthology of writers writing about knitting presented itself when I realized how many writers had told me their own knitting stories. To share those stories with knitters and readers seems not only exciting but necessary. I soon realized that the problem wasn’t going to be getting writers to contribute, but rather to find a way to keep so many knitting stories from flooding my inbox. What you have now is a collection of original essays written by some of the most prizewinning, bestselling, beloved writers writing today…. The impressive collection of writers here have contributed essays that celebrate knitting and knitters. They share their knitting triumphs and disasters as well as their life triumphs and disasters. Some of the essays are about the role knitting plays in the lives of these writers, or of their close family members; some essays are about the curious phenomenon of their interest in knitting but their inability to do it and what that means; some are about the importance of a knitted gift they gave or received; others illuminate the magic of knitting. These essays will break your heart. They will have you laughing out loud. But they will all leave knitters and non-knitters alike happy to have spent time in the company of these writers writing about knitting. If you love knitting, and musing about knitting, that description will be enough. I think most knitters tend to think of knitting as a metaphor for life in some way or other. 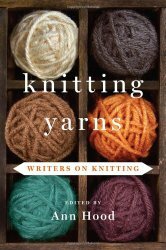 I was surprised at how many different viewpoints, how many different ways of looking at knitting, these authors presented. When I saw that Jane Smiley’s essay had the caption, “The writer discovers what knitting and writing novels have in common, and why she enjoys doing both,” I happily looked forward to a meditation on how both are constructed with a plan and require patient, faithful work. Instead, Jane Smiley proclaimed that in both endeavors, she thinks if you know how it’s going to look, why bother? My conclusion: How you approach knitting is, in fact, similar to how a writer approaches writing. I approach both with a plan; Jane Smiley thinks too much planning makes them less interesting. I went through the whole book at the rate of an essay a day and enjoyed it immensely. There’s nothing like knitting with someone – metaphorically or literally – for making friends. Now that I’m finished, I have to think about the essay I would write if I had the chance. Would I write about my grandma, who knitted all the time? She had a padded canister with a hole in the top out of which yarn came out neatly, and she sat in her rocking chair in the corner and knitted. I loved the pink cabled sweater she knitted me when I was a little girl, followed by the purple granny square poncho when those were in style. The afghan she gave as a wedding present still graces my bed, even though my ex-husband does not. There was a time when my grandma tried to teach me how to knit, but only crocheting stuck. But all I had was dark brown practice yarn. No wonder I didn’t get inspired. I did, however practice crocheting chains and then learning other crochet stitches. But actually buying more yarn? Following a pattern? For some reason, I never thought of doing that. I learned to knit as an adult, from a book. My son was taking piano lessons on the top floor of a shop in downtown Belleville. On the first floor, there was a craft shop. I bought a how-to-knit book, and this time it stuck! My first knitted object I wisely abandoned, but the second thing was a sweater for my son, and it actually turned out super cute! What’s more, my second son demanded to hold the books when we read books at bedtime, so my hands were free for knitting. Before that, my main craft was cross-stitching. But when I finished, I’d never get around to framing the things. And besides, do I really want to stick more things on the wall? And besides, you have to look at the fabric when you’re cross-stitching. Knitting is perfect. Most projects, you don’t have to really look at, and all you have to do at the end is sew up the pieces (Still a problem sometimes), and the completed objects have a use – you can wear them in front of all your friends, who would hardly ever see them if you just attached them to your walls. People tell me they don’t have enough patience for knitting, but I love knitting because it actually gives me patience! Do you know how boring elementary school assemblies can be (except for the five minutes when your kid is up front)? Well, if I bring knitting, I can quietly get something productive done while listening, and thus sit patiently. No matter how boring a meeting is – It’s a chance to knit! And even in interesting meetings, I maintain that keeping my hands busy helps keep me alert and interested. What’s more, it’s given me an excuse to sit and watch a video, or to sit and read nonfiction, for that matter. I’m not being lazy – I’m knitting! But where my passion lies now is with mathematical knitting. My first Master’s was in Math, and I taught college-level Math for 10 years. But I didn’t particularly enjoy teaching – I’m an introvert. And I didn’t particularly enjoy teaching people who didn’t want to be there. I do, however, love Math and think it’s beautiful. And one day I was reading a Knitting magazine and had an idea that changed my outlook. The article told about a blanket someone had knitted that showed how numbers were factored. They took it to school events and had kids stare in fascination – even kids who thought they didn’t like math and weren’t good at it. The only problem was that the article didn’t show a picture of the complete blanket, so it wasn’t clear exactly how they were showing the different factors. But I know enough about math. I could devise my own scheme. And I wouldn’t want to do a blanket. Why not a sweater? Then I could wear it and talk with anyone I see about the beautiful patterns involved. Figuring out how it would work was a huge part of the fun. I found a plain sweater pattern that had a big enough front to make a suitable canvas. I counted up how many colors I would need if I showed the prime factors of all the numbers from 2 to 100, with 1 as the background color. I did some swatches to figure out how to represent two factors, three factors, four factors, five factors, and six factors, with one stitch in between each color, and each number represented as a rectangle of colors. (It turned out that a 7 stitches by 8 stitches grid worked best.) I had fun charting it all out on graph paper, and then finding a yarn with enough different shades (I chose Cotton Classic), and then getting started. Long after I’d finished the sweater, I wrote a blog post explaining it. Three years after that, I wore the sweater to the US Science and Engineering Festival, and showed it to Ivars Peterson at the Mathematical Association of America booth. I told him he could read all about it by googling “prime factorization sweater.” He did one tweet – and that day my website got 17,000 hits! That got me thinking about mathematical knitting again. At last I’d found some people who agreed with me about how cool it was! The original Prime Factorization Sweater had taken so long, and had so many ends to sew in at the end. Could I think of a way to make one that used complete rows rather than a grid? I found a sleeve-to-sleeve cardigan pattern and decided to knit the factors as stripes. But before I did that, I did the same idea in smaller form with a Prime Factorization Scarf. For the scarf, I used a reversible stitch and did two rows for each factor, with two rows of black (representing 1) in between. I was only able to go up to 50, so I decided to use something that would knit up smaller for the cardigan. Instead of two rows for each color, since the cardigan did not need to be reversible, for each number that wasn’t an exact power of a prime, I knitted all the factors into the same stripe. Powers got a row for each factor. But while I was starting the cardigan, some babies joined the family! The cardigan had to be put aside. I used the ideas, with a stitch code (rather than a color code) to make a blanket for my little sister’s new baby with a coded blessing. But when my mathematically-minded little brother was due to become a father, I went back to the prime factorization idea. I used the same Cotton Classic yarn as for my sweater, but this time used entrelac blocks – so I didn’t need to have ten different balls of yarn in the same row, and could work with one color at a time. I liked the Prime Factorization Blanket so much, I hated to give it away. But that got me thinking – Entrelac is an easy way to make Triangles. What if I made a Pascal’s Triangle Shawl? I loved the result – whole new patterns showed up. And after I made the first one, using the same colors as the Prime Factorization Blanket, I thought I’d make one using colors closer together in shade and using intermingled colors rather than blocks of color. (I may have to do a prime factorization blanket that way some day). So, yes, when I think of knitting, I think of planning and counting and calculating. There is an aspect for me of being excited to find out what I’m creating – but as with writing, I need to have a plan. I was reflecting that I’m not sure if I’m going to go back to knitting-by-pattern. (Though I do use a pattern for the basic shapes of my sweaters.) There’s a huge joy in having an idea and planning it out and creating it, stitch by stitch and row by row and seeing how your creation comes out. And there’s something that delights me in seeing mathematical truths before my eyes. And what was I doing? Reviewing a book? That’s right. For any knitters out there, I highly recommend Knitting Yarns. It will get you thinking about knitting in whole new ways and maybe inspire you to write an essay yourself. Tradewind Books, 2014. First published in Canada in 2013. 42 pages. 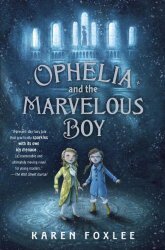 This is a lovely book that takes a situation that would be unfamiliar to most American children and deals with the universal emotions involved in that situation. Anna’s family lives way out in the countryside, and they don’t get their water from a tap. Every evening after school, the children go to the spring for water. All her bigger siblings carry the water back to the house on their heads. 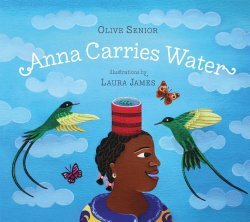 More than anything, Anna wants to carry the water on her head, like they do. They tell her not to try – she’ll get her clothes wet. She cries when they are right. But her siblings aren’t mean about it. They tell her not to worry about it, one day it will just happen. And the rest of the book tells about the day when it does. This also has some humor and a relatable situation. 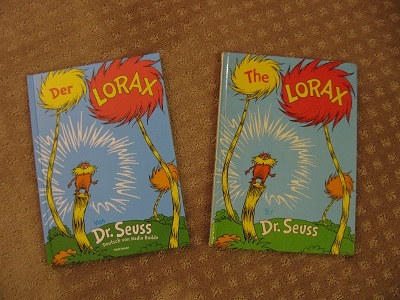 The lovely bright paintings on large pages make the book beautiful. This book will make a wonderful choice for preschool storytime, but also for any child who wants to do things the bigger kids can do. Speak (Penguin), 2008. 376 pages. 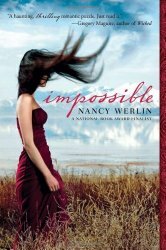 For ages now, I’ve been meaning to read Impossible, by Nancy Werlin. I keep meeting Nancy at ALA conferences and like her very much indeed, and every time I was embarrassed that I haven’t yet read her work, even though I’ve wanted to since before I ever met her. Part of the problem is that I own a copy of her book, so it doesn’t have a due date, so I don’t get around to it as quickly. But I like to bring my own books on vacation, and I like to bring paperbacks. So when I left for a week in Oregon, I put Impossible first on my list of books to read on the plane. The only problem with that? When I finished, I liked it so much, I didn’t really want to start another book, since I wanted to savor the one I’d just finished. However, while in Oregon, I visited Powell’s, and bought the two sequels, so now on the way home I can continue to feast on Nancy Werlin’s books. The premise of Impossible is that the ballad “Scarborough Fair” actually happened and tells of an actual curse that was put on a young woman and her daughters after her, and her daughters’ daughters down through the generations to today. An elfin knight demanded her love, and she could only escape if she performed three impossible tasks. And then, eighteen years later, her daughter must perform the three impossible tasks or be caught in the same curse. What I love about Impossible? All the reasons why Lucy Scarborough’s case is not hopeless. Even though her mother’s a crazy bag lady, she’s been brought up by warm, loving, and wise foster parents. And there’s a young man who truly loves her. So she doesn’t have to complete the challenges alone. And the story of how she does so is truly beautiful. I also like the way this unbelievable, impossible curse is woven into a story of a modern-day believable seventeen-year-old girl with ordinary concerns like being on the track team and going to Prom. I like the way all the characters realistically have a hard time believing it and the modern ways in which they tackle the challenges together. Most of all, I just love Lucy and the people around her. 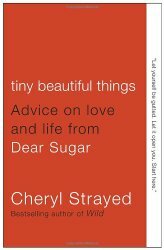 Nancy Werlin has written a brilliant book about True Love. Ours will be true love for all time. Source: This review is based on my own copy, which I got at an ALA Annual Conference. You are currently browsing the Sonderbooks blog archives for August, 2014.